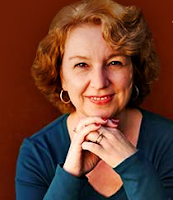 Each year, SCBWI offers the Sue Alexander Award to the manuscript deemed most promising for publication, selected from the SCBWI Annual Summer Conference critique pool. Industry professionals (editors, agents, authors) who critique the manuscript determine the finalists. Until her sudden death in July, 2008, Sue Alexander made the final selection. Now, a three-member panel from Sue’s writing group of 20 years decide on the winner. This year's Sue Alexandar Award-winner is Marilyn Hilton for her middle-grade manuscript HOVER OVER ME. In Hilton’s lovely, well-written manuscript, a girl who longs to believe in angels, “being in vital need of their assistance” endures bullying, wonders about her birth parents, makes an unexpected friend and tries to solve the mystery of the crime for which her missing brother has been falsely accused. Along the way, she learns something about the nature of angels. A sensitive voice, evocative detail, a rich sense of place, strong tension, intriguing characters with compelling problems and a satisfying theme all combine to make author Hilton’s manuscript a promising novel for middle-grade readers. Karen Bonner for WITCHING MOON. Congratulations to Marilyn, Pati and Karen for their terrific work! 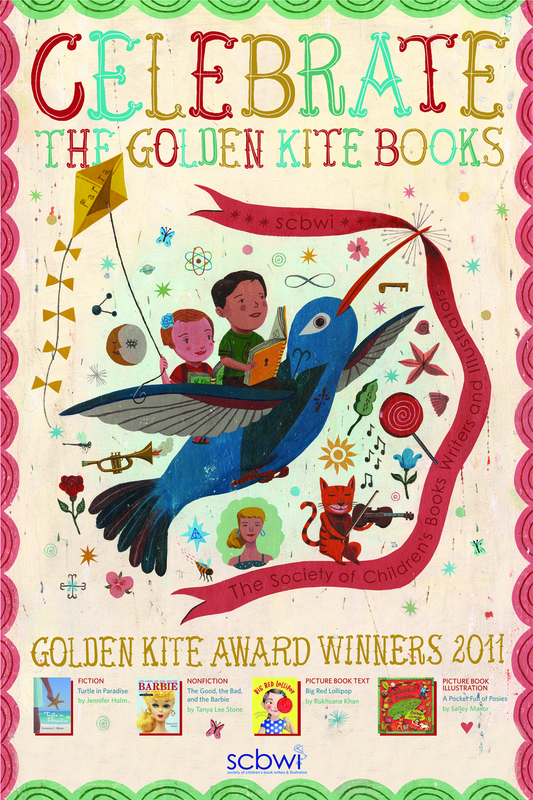 To learn more about the award and see a list of past winners, visit SCBWI.org. The folks at MeeGenius!--a e-picture book app for young readers for iPhone, iPad, iTouch, Google TV, and the web--have just kicked off a contest. Open to both aspiring and published authors, the MeeGenius! Author Challenge 2011 will award one winner $1500 and a publishing contract as well as offering a MeeGenius! library to the school of the winner's choice. Three runners-up will win $500 and publishing contract. Submissions will be posted on the MeeGenius! website where visitors can vote on their favorites. The most popular picks become finalists. The deadline for entry is November 1st and winners will be announced in March. For complete rules and guidelines, visit MeeGenius.com. On Fridays I've been sharing snippets of and links to news I've read during the last week that I found interesting, helpful, and/or fun. Going forward, I'm moving this feature to the weekend to work better with my now-more-full schedule. 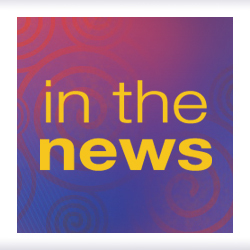 This week's news includes a new Scholastic/Ruckus imprint, a children's publishing newsletter launch, iPad 3 news, an editorial against agent-publishers, online/app safety for kids, a new property for Penguin, and more. Children's digital developer Ruckus Media is joining with Scholastic to create the Scholastic Ruckus imprint, a joint venture that will publish a wide range of children's and teen content across all platforms, from interactive content and transmedia projects to e-books, enhanced e-books and print. The first titles from the Scholastic Ruckus imprint will be released in 2012. Publishing Perspectives, the online industry news journal, has launched its first newsletter focused on children’s publishing. Wondering when your local Borders will close? Borders Group entered liquidation this summer, closing its remaining 399 stores and cutting around 10,700 employees. On the bookseller’s Facebook page, you can now see a list of the closure dates for your local Borders bookstore. As Amazon is gearing up to announce a new tablet, Apple is already hard at work on the iPad 3. According to a report from Apple Insider, the third generation iPad will be slimmer and lighter, and possibly more expensive. The Federal Trade Commission last month announced a $50,000 settlement with app maker W3 Innovations for collecting and dispersing information of kids under 13 in violation of the Children's Online Privacy and Protection Act, or COPPA. The folks at bit.ly, the popular URL shortener service, asked themselves just how long a link shared on a social network “lives”. And they found out that links shared on Twitter lasted only half as long as links shared on YouTube. Nearly two thousand years ago, Plutarch wrote of a great ship that bore Theseus home from Crete. As its planks decayed, the plucky Athenians preserved it by replacing each rotting board in turn, until eventually nothing was left of the original vessel. Was it then the same ship? Plutarch asked. Or was it something wholly new? Penguin USA has acquired the license for Little Airplane Productions’ Small Potatoes, a preschool-targeted series of animated musical shorts. The series has taken off on Facebook and debuted on U.S. television September 6, on Disney Channel’s Disney Junior block. Penguin Young Readers Group’s Grosset & Dunlap division will publish a series of at least 10 books starting in early 2013, with Little Airplane handling the writing and design. The launch list will include a sticker book, an 8x8 and a board book. Autumn: A Great Time for ConferenceTravel! While the SCBWI Annual Summer and Winter Conferences are consistently fabulous, I must admit I always long for an equally awesome autumn event. I adore traveling this time of year. No sweaty luggage lugging. No stuffing winter coats in the overhead bin. Just bordering-on-brisk, leaves-ready-to-change, settling-into-your-airplane-seat-wrapped-in-a-cozy-sweater loveliness. Fortunately I'm headed northwest next week, off to the KidLitosphere's 5th Annual KidLitCon held this year in Seattle September 16-17. Most of SCBWI TEAM BLOG will be there. And Scott Westerfeld. And lots of talk about promotion and blogging and social media and marketing and all sorts of useful things. If you aren't headed that way, I'll clue you into the action via my blog, Twitter (etc.). Click here for a list of September SCBWI events. Click here for a list of October SCBWI events. Click here for a list of November SCBWI events. Are you attending a fall conference or event (SCBWI or otherwise)? Share your destination in a comment and clue in others would-be travelers.